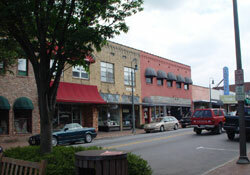 Waynesville NC is a picturesque mountain town centrally located between Asheville NC and a wealth of protected forest lands. In fact, about 40% of Haywood County is occupied by the Great Smoky Mountains National Park, Pisgah National Forest, and Harmon Den Wildlife Refuge, where the Blue Ridge Parkway meets the Great Smoky Mountains. The Smokies are renowned for their variety of plant and animal life, over 800 miles of hiking trails, trout fishing, and white water creeks. Pisgah National Forest is home to another cultural landmark. One of its peaks, Cold Mountain, was made famous by Charles Frazier,s novel Cold Mountain, and again in the 2003 motion picture of the same name. Downtown Waynesville has a beautiful historic Main Street with art galleries featuring talented local artists, and dining from casual to exquisite at local restaurants. Try Lomo Grill for healthy and delicious Argentine beef, great pasta and fish; or the Sweet Onion for a refined taste of Southern culture. And don,t forget Panacea in the area of town known as Frog Level. They blend, roast, and grind their own beans for a fabulous cup of coffee. If you are looking for a decadent desert, a great cup of coffee, and occasional music amidst shopping for unusual furnishings and antique reproductions, try Pheasant Hill on Main Street. If pizza is your pleasure, along with locally brewed beers, stop in at Nick and Nate,s.